Last night The Event Space played host to The Future of Design, an open discussion with 6 designers. Alongside our very own Ben Terrett, Mark Holt, Stuart Watson (VentureThree), Marina Waller (Wolff Olins), Carl Burgess (More Soon) and Mills (ustwo™) all took to the stage. Click on the image below to see how the event played out in tweets! It was a fantastic night that raised as many questions as answers. Thanks to all who, came, saw, spoke and tweeted. a weekend for the arts, software and hardware hackers to get together and create exciting things. It's been produced by The Royal Opera House, and as part of Wieden + Kennedy Inspire, W+K London are providing the event space, and some of our account people, creatives (and creative technologists) and planners have come along, too. 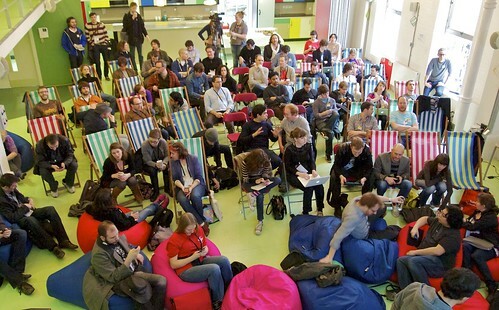 Here's a crowd gathering for the 'lightning talks' session in the afternoon. There's a good bunch of people talking. If you're reading this on Saturday 15th or Sunday 16th January 2011, it's happening right now. Keep an eye on on @culturehackday and #chd11 for updates and highlights, and the official photos. Big thanks to Donna and Pete and Gav for helping sort out the building and IT for everyone - they've been working through the day to make sure everyone has a good day. Last week we were lucky enough to have the talented Stewart Smith in to give an inspiring talk on code play. Stewart is an artist / programmer from New York who currently operates a consultancy in London called Stewdio. Stewdio approaches art and software through the lens of graphic design. He has a real enthusiasm for playing with digital tools; not just making things for clients, but following through on ideas that come out of play and experimentation. One project Stewart spoke about was Windmaker. This is an ambient weather widget which applies the current wind conditions to (almost) any Web site. It uses United States ZIP code to grab local conditions from the Yahoo! Weather RSS feed. It then breaks down a Web site into individual pieces such as text blocks and images. Finally, WindMaker sets the pieces in motion according to the strength of the wind. WindMaker from Stewdio on Vimeo. And watch windmaker in action on wklondon.com here. Thanks for coming in, Stewart. Many of the Guardian's most interesting experiments at the moment lie in this area of combining what we know, or believe, or think, or have found out, with the experience, range, opinions, expertise and passions of the people who read us, or visit us or want to participate rather than passively receive. So, watch this space for news of tools and apps developed by Wieden + Kennedy using Guardian content, for ourselves and for our clients. Last week W+K London got a chance to meet the charming Dominic Harris, the founder and creative director of Cinimod Studio. This London-based, cross-discipline practice specializing in the fusion of architecture and lighting design. It has gained wide publicity with their latest works, such as the Snog store concepts in Soho and Westfields along with the interactive light installations commissioned by the Itsu chain. In a brief and intense one-hour presentation Dominic managed to talk about building UFOs, re-creating wonderlands, his creative passion for butterflies and a whole bunch of LED inspired things. Wieden+Kennedy London highly recommends a visit into http://www.cinimodstudio.com/ to check out Cinimod’s impressive resume.